We are into our last 6 weeks here, which feels extraordinary (when we have time to think about it!) Life continues apace. We are delighted to have Sarah Miller, a clergy friend of mine, to stay for 2 weeks. Sarah has been sharing the usual round of church, college and local visiting with us, and was made warmly welcome when we were invited to the home of one of my 3rd year students, Nicodemus, and his family. I am enjoying having a teaching colleague, and we laughed at the clothes co-ordination when she was helping a small group discussion during a class on preaching. At the end of next week, after Sarah's visit, we will receive a group from St Barnabas, and at the end of the month the Dean of Gloucester will come. In the other photo is Ruben, one of our students training on the evangelists' course, with his fiancee. 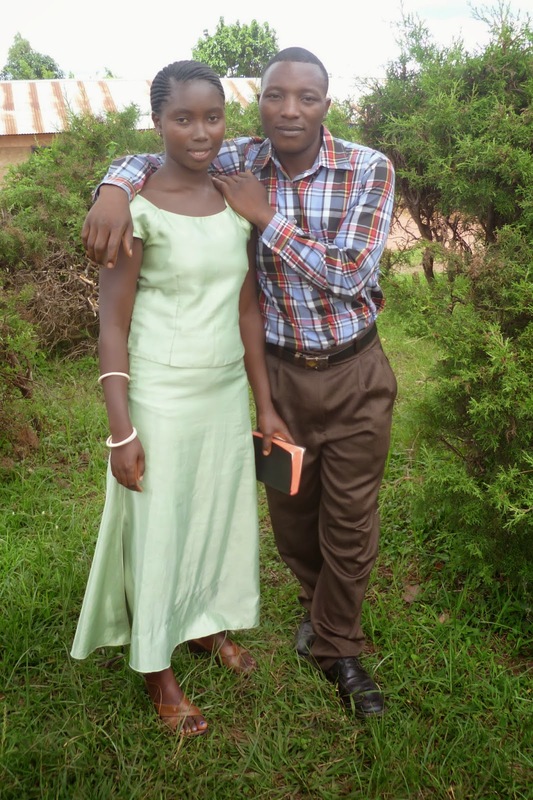 We were at their church last week, and they were thrilled for the opportunity of an official photo together. They will be married in June. However marriage is difficult for young people here as there is still a tradition of bride price that must be paid by the groom, or his parents. Whereas this used to be in the form of cattle, or crops, it is now cash. The 'price' of an educated girl can be up to 2 million shillings (more than a year's average salary). Several of our students are hoping to marry but think that it will be years before they can find such money. It is a sad and difficult situation for many young people who I know. Post script : Unfortunately the Easter week has not brought resurrection for our car, which has suffered an expensive and untimely death.